Check out the latest issue of Rue Morgue Magazine, #91, (follow the link here for more details and how to purchase online). BacktoFrankBlack features in their Dreadline features, to quote, "Movement to revive Chris Carter's Millennium gains online momentum." The feature carries an interview with yours truly. There is plans in motion to have BacktoFrankBlack highlighted again on the Rue Morgue radio station, hopefully with Lance Henriksen as the guest interview. Keep your eyes peeled and your ears flappy for more news on that event! When The Blair Witch Project - which was made for around the cost of a new Toyota - was released ten years ago, it succeeded beyond all expectations and went on to change the face of horror. Rue Morgue goes back to the woods of Burkittsville with directors Daniel Myrick and Eduardo Sánchez to examine the lasting effects of The Blair Witch Project. Plus: Catching up with Blair Witch star Michael C. Williams, and previews of Myrick's The Objective and Sánchez's Seventh Moon. Halloween comes early this season courtesy of October Shadows, a book that collects images inspired by everyone's favourite time of year. There was a time when families would have a cast of a loved one's visage made as a funerary memento. Now, one man is reviving the practice for modern mourners. One of the most punishing movies every made just got a lot more brutal with a restored director's cut. Filmmaker Buddy Giovinazzo recalls his struggles making Combat Shock. 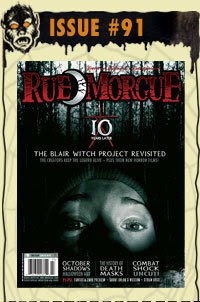 3 Responses to "RUE MORGUE magazine features BacktoFrankBlack"
Excellent work James! I have already ordered my copy! This is great news. Publicity is the key word. Wonderful article. I really enjoyed reading it. Hope to see another article in the future with Lance.